IT professionals are constantly looking for a solution that will improve operational efficiency and allow them to have a highly flexible infrastructure. However, building such an environment can be difficult and costly. Fortunately, it does not need to be this difficult. 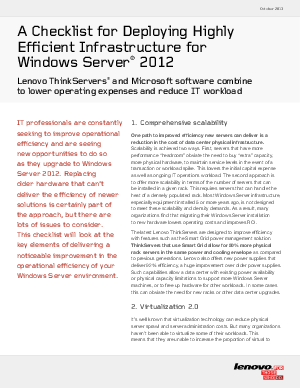 Download this whitepaper to learn the 5 steps for successfully deploying highly efficient infrastructure for Windows servers and see how you can lower operating expenses and reduce IT workload.